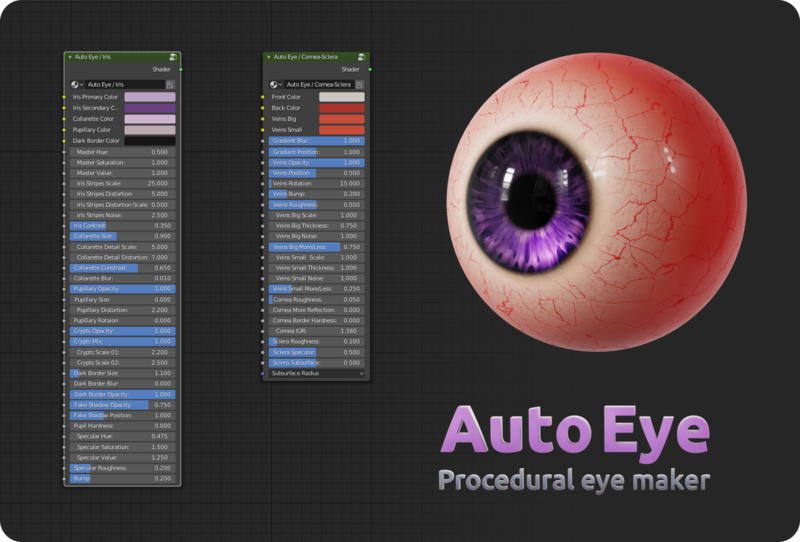 Auto Eye is a 100% procedural generated eye for Blender Cycles and Eevee, fully customizable and focused on make easy to create a wide variety of styles. From realistic to cartoon and even animal eyes, like cat eyes. Why you need Auto Eye? The eyes are one of the first things you look at on a character. Nice looking eyes will make your character look alive and Auto Eye will help you in that. Customize your eyes the way you want! Since Auto Eye uses procedural textures, you don't need to worry about resolution. Your eyes will hold well even for close up cameras. For animation, you can turn off the visibility of the cornea in the viewport and see where your character are looking at in Solid mode. "I just spent 15 minutes playing with it and I must say, it's as brilliant as I expected! I honestly can imagine using this for every character I did going forward." Auto Eye comes with two modifiers, a Subdivision Subsurface and a Mask modifier to turn on and off the cornea visibility. The Mask modifier is particularly useful to see where your character is looking on the viewport, in Solid mode. Make sure to always leave this modifier turn off for the render and only use the display on viewport option. You find 8 Shape Keys on Auto Eye. 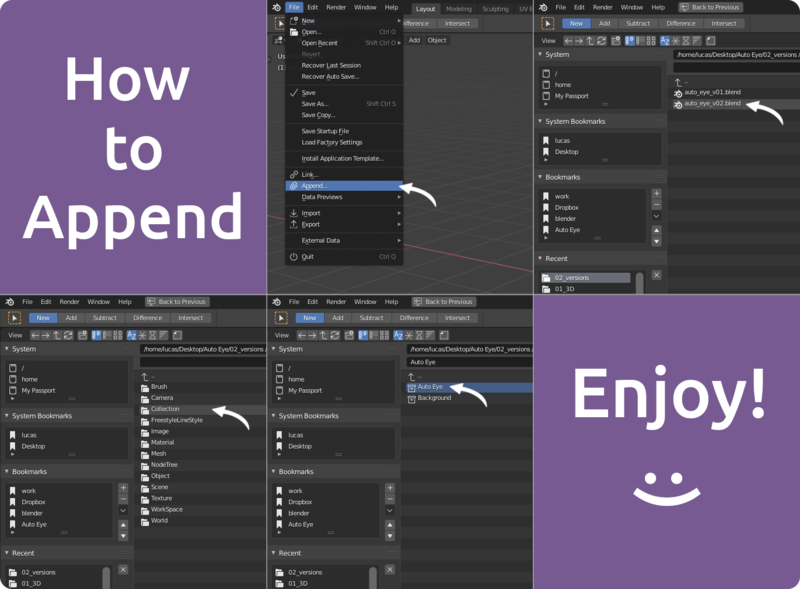 To take advantage of the real time preview in Cycles you just need to enter the LookDev mode in Blender 2.8, if the preview don’t look correct you need to setup somethings inside Eevee first. After change the render engine to Eevee, in the Render tab you need to enable the Screen Space Reflections and the Refraction option inside the same sub menu. Them select the Auto Eye and go the Material tab, select the Cornea-Sclera material and make sure that the Screen Space Refraction option is enable. Now you can back to Cycles render engine and enter the LookDev mode and the real time preview should works fine. Go to File>Append then navigate to the auto_eye_v02.blend and click on it. Then go to the Collection folder and append the Auto Eye Collection. Primary Color Control the main color of the iris. Secondary Color Control the secondary color, to add subtle color variation. Dark Border Color Control the color of the dark border around the iris. Master Hue Parameter who controls the overall hue of the iris. Master Saturation Parameter who controls the overall saturation of the iris. Master Value Parameter who controls the overall value of the iris. Fibers Scale Parameter who controls the scale of the fibers, higher values will result in more thin lines and lower values will result in less and large lines. Fibers Distortion This parameter will add distortion along the fibers. Fibers Distortion Scale This parameter controls the scale of the distortion. Fibers Noise Add a noise texture on top of the fibers. Fibers Contrast This parameter adds more contrast to the fibers colors. Collarette Size Controls the size of the collarette. Collarette Detail Scale Controls the scale of the stripes inside the collarette. Collarette Detail Distortion Controls the distortion of the stripes inside the collarette. Collarette Contrast Controls the contrast of the collarette. Collarette Blur Add blur on the stripes inside the collarette. Pupillary Opacity Controls the opacity of the pupillary color. 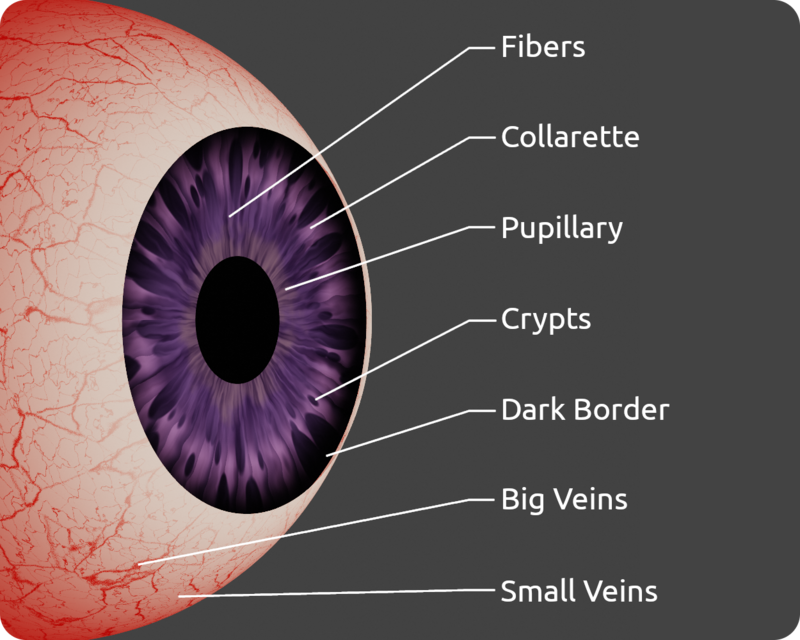 Pupillary Size Controls the size of the pupillary. Pupillary Rotation Controls the rotation of the pupillary. Crypts Opacity Controls the transparency of the Crypts 01 and 02. Crypts Mix Controls the mix between Crypts 01 and 02. Crypts Scale 01 Controls the scale of Crypts 01. Crypts Scale 02 Controls the scale of Crypts 02. Dark Border Size Controls the size of the dark border. Dark Border Blur Controls the blur of the dark border, this may not work for close ups. Dark Border Opacity Controls the transparency of the dark border. Fake Shadow Opacity Parameter that add a fake shadow at the top part of the iris. Fake Shadow Position Controls the position of the fake shadow, up and down. Pupil Hardness Controls how hard the pupil line will be. Specular Hue: This parameter controls the Hue of the specular. Specular Saturation: This parameter controls how saturated or not the specular will be. Specular Value: This paramenter controls the Value of the specular, kind of controls the specular intensity too. Specular Roughness: This paramenter controls the roughness of the iris specular. Bump: This parameter controls the bump strength. Front Color Controls the color of the front part of the sclera. Back Color Controls the color of the back part of the sclera. Veins Big Controls the color of the big veins. Veins Small Controls the color of the small veins. Gradient Blur Add blur between the front and back color gradient. Gradient Position Controls the position of the gradient, forward or backward. Veins Opacity Controls the transparency of the veins. Veins Position Controls the position of the veins, forward or backward. Veins Rotation Controls the rotation of the veins. Veins Bump Controls the strength of the bump in the veins, this affects only the big veins. Veins Roughness Controls the roughness of the veins. Veins Big Scale Controls the scale of the big veins. Veins Big Thickness Controls the thickness of the big veins. Veins Big Noise Adds a noise/distortion along the big veins. Veins Big Noise Scale Controls the scale of the noise on the big veins. Veins Big More/Less Adds more or less big veins. Veins Small Scale Controls the scale of the small veins. Veins Small Thickness Controls the thickness of the small veins. Veins Small Noise Adds a noise/distortion along the small veins. Veins Small Noise Scale Controls the scale of the noise on the small veins. Veins Small More/Less Adds more or less small veins. 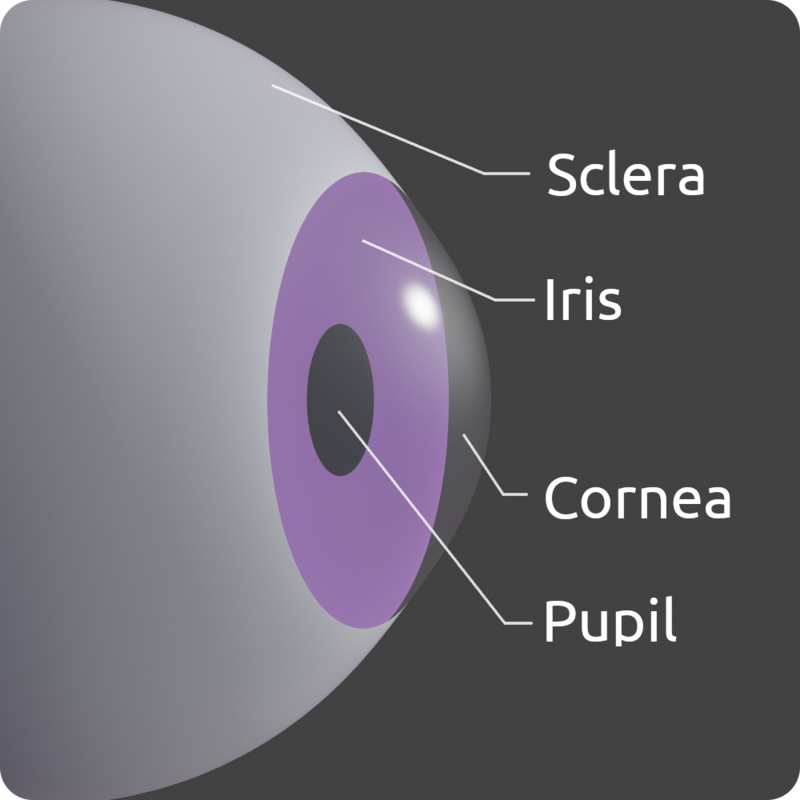 Cornea Roughness Controls the roughness of the cornea. Cornea More Reflection Adds more reflection to the cornea. Cornea Border Hardness Controls how harder the outer border of the cornea will be. Cornea IOR Controls the index of refraction of the cornea, suggestion to use 1.3 for more cartoon character and 1.38 for more realistic characters. Sclera Roughness Controls the roughness of the sclera. 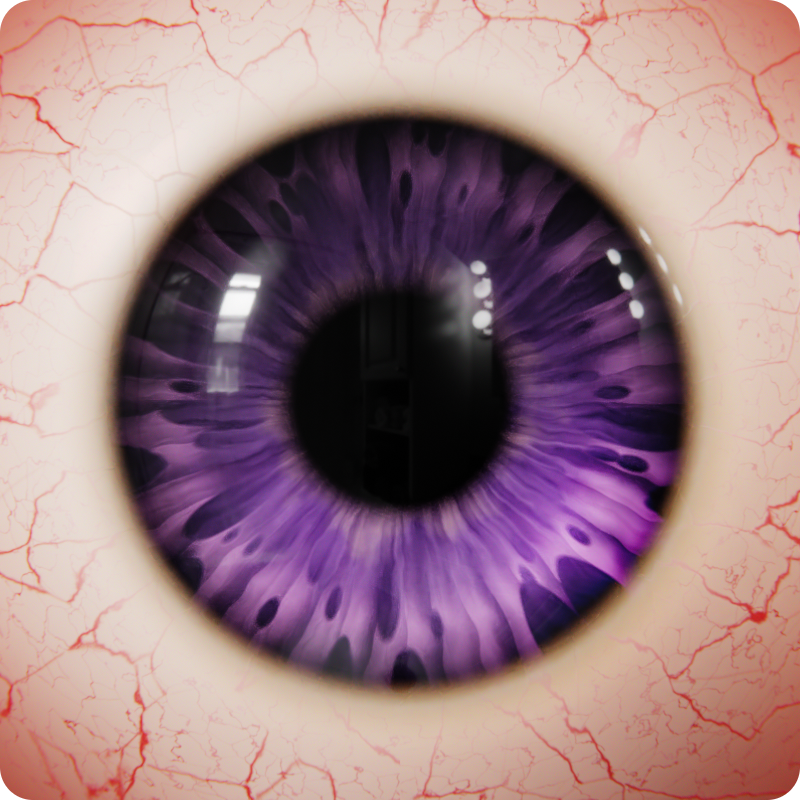 Sclera Specular Controls the specular of the sclera. 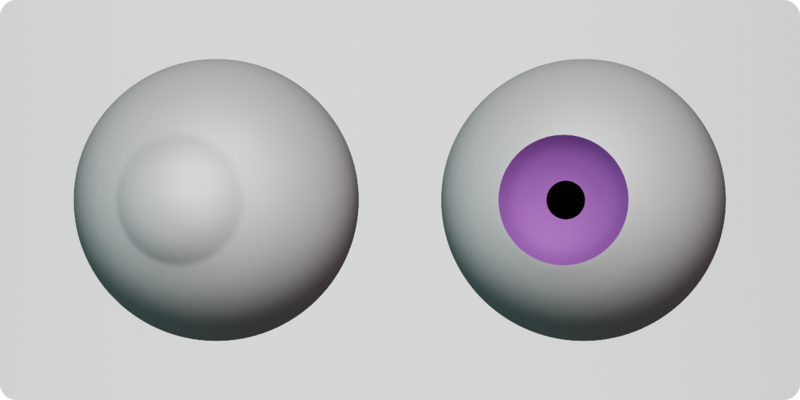 Sclera Subsurface Controls how much Subsurface Scattering the sclera will have. Subsurface Radius Controls the radius of each R, G, B channel of the Subsurface. This item has an average rating of 5 from 4 ratings by the community. Auto Eye is the best procedural eye generator I've seen so far. You can customize literally everything to make the perfect eye for your characters and not just for humans but for animals like cats, snake and even herbivores like goats and horses. The creator is also very kind and open to questions and suggestions. I would recommend to every character artists. This new update is fantastic. Thank you. Fantastic Eyeball! Easy to setup and control the look of the eye. Very simple, and easy to use. The overall look of the eye is very realistic. Customization is also very user friendly. Would highly recommend to anyone.